The Galera IV apartment has been just renovated and furnished with the best quality. all the furnitures like the beds, sofa, or the whole kitchen have been selected carefully to asure the maximum comfort for our guests. The apartment is a duplex, where on the first floor there is a bedroom with double bed of 1.50 x 1.90 cm, the living room with dinning area opened to a modern kitchen fully equipped with everything you might need during your stay, and a complete and independent bathroom. On the top floor we find the third bedroom, with a double bed of 1.50 x 1.90 cm, a full bathroom, and the exit to the wonderful furnished terrace. Galera Street is situated right in the center of Seville, at the Arenal quarter, maybe the most coveted and exclusive area of the city, and even though it’s a very quiet street as it’s semi-pedestrian, and has no shops or bars. And just turning the corner it’s very easy to find everything our guests may need: many bars and restaurants where tasting the best cuisine and the famous tapas, small grocery stores, gourmet shops, supermarkets, and even a traditional market, located a few meters from the apartment, where buying the best classic fresh products of the Andalusian and Sevillian gastronomy. 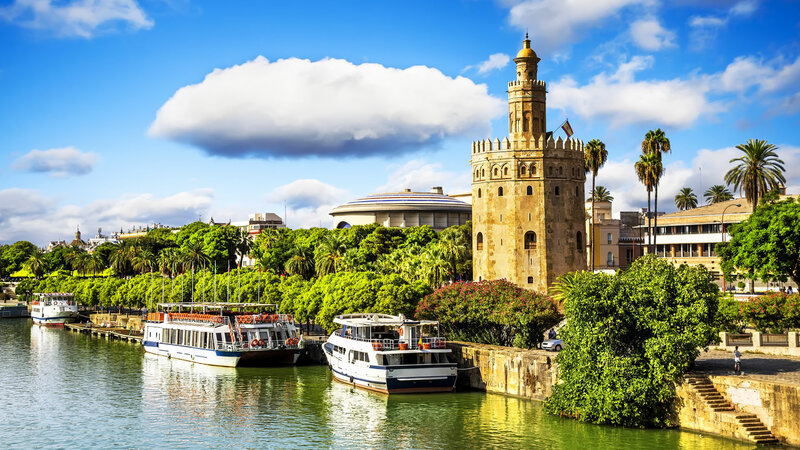 The most important monuments of Seville such as the Cathedral, the Alcázar, the Giralda, etc., are also a few minutes walking from the apartment.